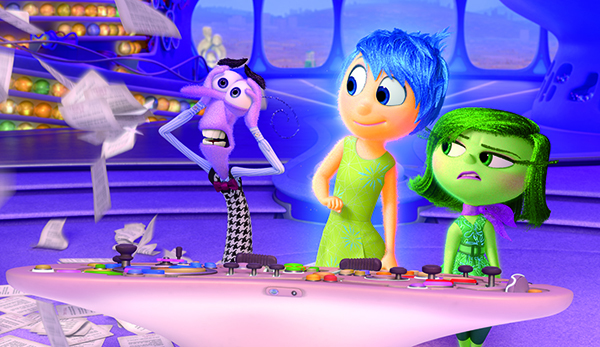 Six years after the success of Up, the brilliant creator of Monsters, Inc., Pete Docter is back with Inside Out. Featuring in this year's Official Selection, the film brims with humour as it follows the adventures of Joy, Fear, Sadness, Anger and Disgust, five highly colourful characters whose job is to manage the emotions of Riley, an eleven-year-old girl in the throes of adolescent crisis. Pete Docter explains. What was the film's starting point? After Up I was on the hunt for new ideas. At the time, my daughter was 11, and had just hit adolescence head-on. She went from being a little girl with loads of energy to a teenager who was sometimes rude, when she deigned to speak at all. I wondered what was going on in her head. This is what germinated the idea of characters based on emotions. The originality of Inside Out lies especially in the fact that the viewer is plunged inside the subconscious of this little girl, which serves as the setting for the film. Was this difficult to describe visually? Very difficult. We spent a lot of time on all aspects of the film, from the creation of the characters, to the setting, to the story itself. It was a very abstract idea and our job was to make it concrete. We wanted to explain how memory functions, why certain songs stick in our minds and where our dreams come from. We wanted the audience to find our idea plausible. At what point, as the film took shape, did this idea of characters representing emotions come to you? Right at the beginning. Joy was the first, who I initially called "Optimism", due to a lack of knowledge about emotions. During our research, we spoke to psychologists and psychiatrists and realised that the number of listed emotions is an area of debate. We chose five, because we didn't want too many, or writing the screenplay would have become a real headache. What else did you learn from the experts? That our emotions influence our life in society, for example. Some, like fear, manifest themselves physically and can sometimes protect us. They also play a part in interpersonal relationships. This is how we used all the emotions featured in the film. What technical difficulties did you have to get over? I didn't want the characters to resemble humans, so I gave the technical team the challenge of making them resemble what we feel. They came back to me with the idea that they should be made of a sort of energy. If you look closely at each character, you'll see they release tiny particles of colour when they move around. It was a meticulous process. The difficulty was that two stories were being played out at the same time: Riley's, as she moves from the country to the city, and Joy's, as she is swept out of the main part of Riley's mind and tries to get back. But each story communicates with the other and influences it. What we had to do was create links between cause and effect.